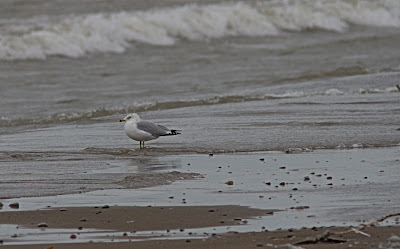 Yesterday was the Blenheim/Rondeau CBC. 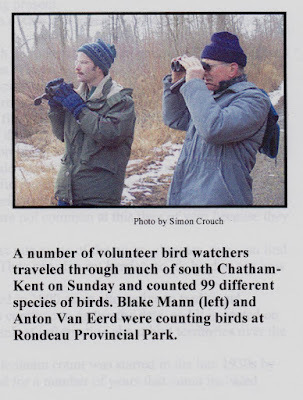 This count originally started back in 1939 by the long since defunct Kent Nature Club. The 15 mile diameter circle has been adjusted considerably since then, but it has a long history. I have data going back to 1968, and the numbers certainly have changed as one would expect. For example, Red-headed Woodpecker was quite regular. A high of 114 was recorded in 1982! This year there were none. I have been doing this count since the late 1980's. I mainly do Rondeau Park south of the visitor centre each year. 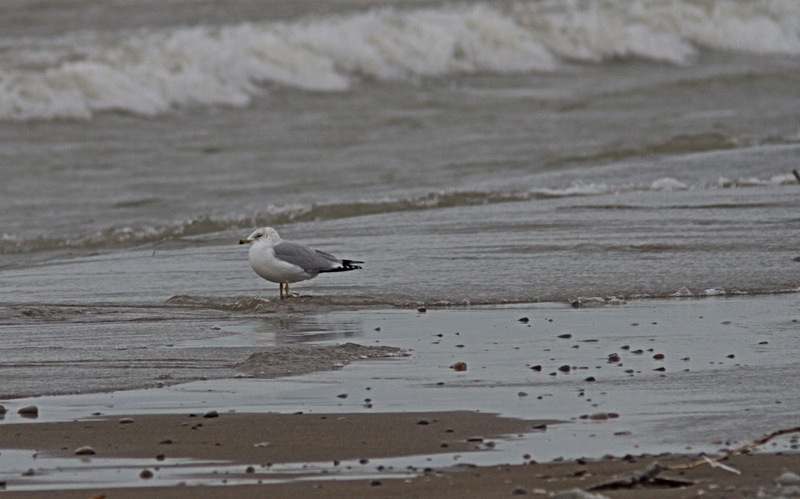 Every year is different with regards to birds, and indeed the weather. We have had all kinds of weather including gale force winds, balmy and no snow, lots of snow and perfect weather. One year it was blowing and snowing all day, and I could not make it home past Chatham. The Wheels Inn was quite accommodating to snowbound travelers! Conditions were not the best for walking yesterday due to the deep slushy snow, but we all persevered to find some decent birds. 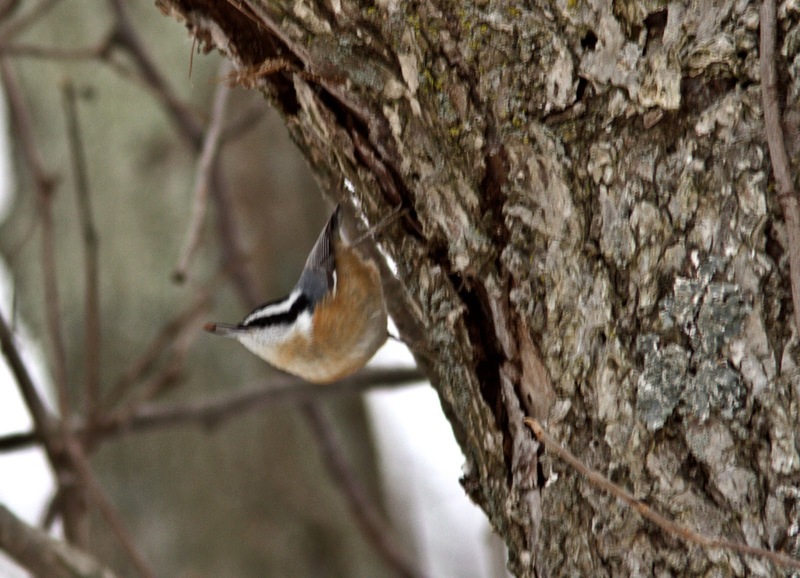 Last week's cold and snowy weather no doubt pushed out some lingering birds, but we managed a collective total of at least 98 species. 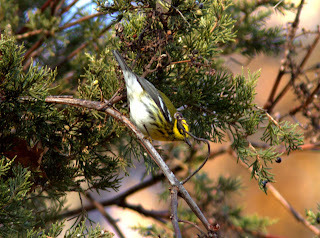 Undoubtedly, the star of this year's show was the long-staying Townsend's Warbler in Bate's. Other decent finds were Red-throated Loon (2), Lesser Black-backed Gull (2), American Pipit (seems regular anymore), and Orange-crowned Warbler. Snowy Owls were once again high in numbers This is the fourth winter in a row we have seen lot of Snowy Owls in the southern Ontario (is this going to be the norm?). 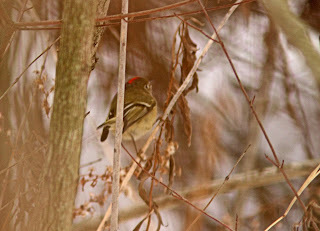 Ruby-crowned Kinglets seem more regular with a total of 8 yesterday. We found two in our walks. As well, Fox Sparrows are plentiful (I recorded 13). I have had various people helping me over the years. Maris Apse was a regular when he retired and moved to the area. Another regular was Anton (Tony) Van Eerd. We were interviewed by Simon Crouch in 2002 as this photo shows. This year I was joined by Londoners Quinten Wiegersma and his father. 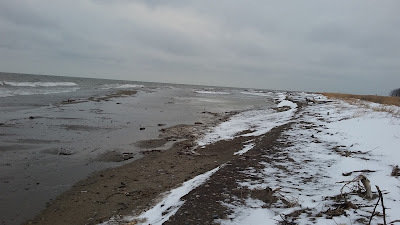 As the winds were brisk from the east, we started with a one hour lakewatch at dog beach. I had never done this before, but it was productive as lots of ducks were moving--certainly adding to our totals. Lots of Red-breasted Mergansers were on the move. 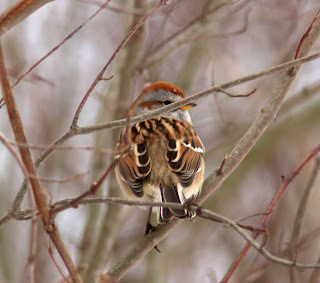 Quite a few Commons were seen as well. Long-tailed Ducks were plentiful at dog beach. I tallied 58 moving in the distance, which was rather incredible. I usually do not see any on this count! A few White-winged Scoters were on the move. I was hopeful for a Purple Sandpiper, but it was not to be like a few years ago. I would have called Jeremy Bensette first off, who was just outside the park! We kept an eye on the lake as much as possible. This view near the light beacon shows a good spot for shorebirds. There was a lot of debris along the beach due to the relentless winds of late. At the lookout on south point trail, we did spot two distant Red-throated Loons (we had one last year), which was a nice addition to the day's count. The Eastern Towhee or Brown Thrasher did not show for us at the visitor centre while we ate lunch. The towhee was seen earlier though--perhaps a returning bird each winter. We checked the campground which was quiet except for a pure flock of 7 Fox Sparrows and a flyover flock of 55+ Common Grackles. 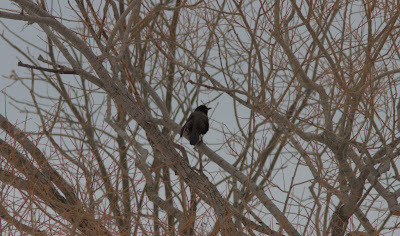 In fact, grackles were rather plentiful, as we had several at a feeder along Lakeshore Road (along with some Red-winged blackbirds). Nobody had checked the maintenance loop where we tallied a Ruby-crowned Kinglet. 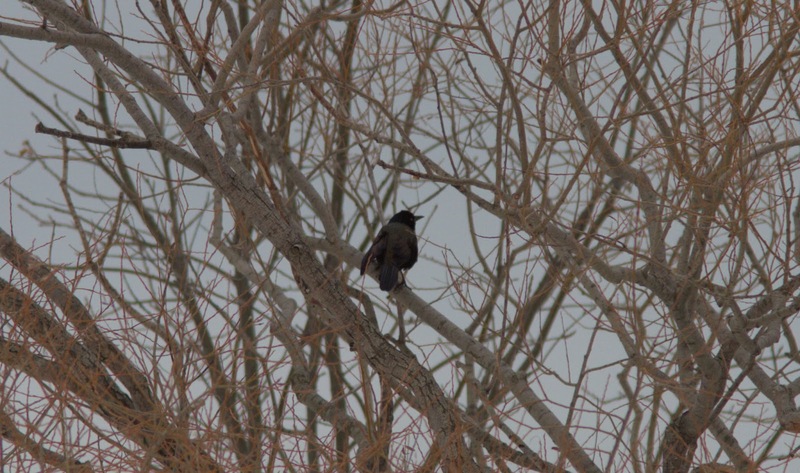 Some distant birds were likely Yellow-rumped Warblers. Quinten wanted to see the Townsend's Warbler, so I went back to south point trail where I upped the numbers of some birds we had already seen. 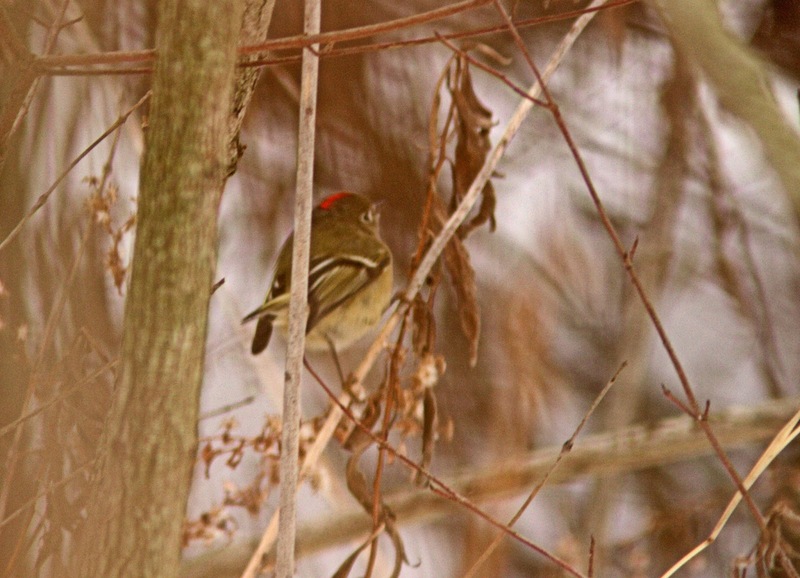 Included was another Ruby-crowned Kinglet which I could not focus on! A couple more Red-breasted Nuthatches were working the trunks of trees. American Tree Sparrows have been scarce this year so far. Bald Eagles seemed to be migrating this day, and we saw five at once at dog beach. Also in large migrating numbers, were Canada Geese. Big flocks were seen over the lake, where I tallied about 750. It was a gloomy morning (yes, weekend), so photos were not all that great. The next count "our gang" will be doing locally is the Wallaceburg one on the 27th.